The last one! So insisted we had our breakfast at Jack's. It was sort of a tradition when we started doing the LOOP, but we had got slightly bored of it. But for the last one, we had to. After that, tubes to Oxford Circus, Mile End and Upminster Bridge. Just after leaving Upminster Bridge station, we encountered a rather bizarre situation: an HGV lodged in a florist. Apparently it had clipped the bridge, and then went straight into the building. How rude. Shortly after, we passed the Windmill pub, but only saw the Upminster Windmill in the distance. After crossing a bridge over the Ingrebourne River we took a right turn to follow the river. Almost for the entire length of this section. First we encountered some playgrounds, but after a while we made our way into the Ingrebourne Valley Local Nature Reserve, which connects to the Hornchurch Country Park. Lots of wetlands, some ponds with birds, and a few buildings remaining from the second World War, when this was RAF Hornchurch. It was a fairly pleasant and level walk. One of the stranger features was the Ingrebourne Hill Bike Park however, when you can try out some mountain biking! At the bottom of the park, we had to cross the busy A1306, but a new pedestrian crossing made that easier. On the other side we found a big Tesco's where we acquired some water. 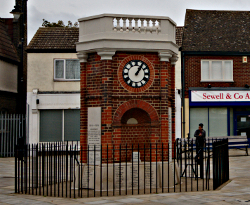 Passing a few pubs, with, uhm, not so decent ratings brought us into Rainham Village, with its clock tower war memorial and an old Norman church. A few minutes later we reached Rainham station, and the end of section 23. Here we also ran into another group walking the LOOP—and they were also attempting to finish it on the same day. 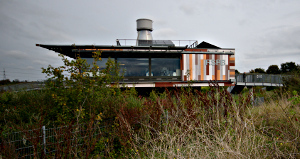 After passing the other group on the footbridge over High Speed One, and crossing underneath the busy A13, we soon came to the Rainham Marshes. We followed a LOOP sign on a path through the Marshes. However, after a few minutes we noticed it wasn't quite following either the directions off the Walk London website, but also wasn't following the mapped route from OpenStreetMap. We back tracked a little and instead had to go through some industrial area around Ferry Lane. We then also didn't spot a LOOP sign for quite some time, and the directions were also slightly misleading too. I have reported the mismatched signing, and I actually hope they redirect the LOOP through the Marshes instead of around factories and a land fill! Taking the mapped route did get us to the Thames quite soon though. Here we spotted lots of birds as we went past the Tilda rice factory. Just beyond the factory we stumbled upon a dozen concrete barges, originally part of a Mulberry Harbour used in the D-Day landings of the second World War. We also spotted The Diver, an artwork by John Kaufman. The rest of the walk around the landfill area was kinda tedious, but easy going. We were however confused by some fence once getting to the Rainham Marshes proper. 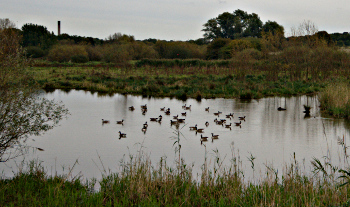 This reserve, run by the RSPB, is one of the few left over ancient marshes. They have a nice visitor's centre on the East side, which also had a very decent café. After a restorative slice of cake, and crossing a new footbridge, we had some fun with photographing all the PHP Elephpants. 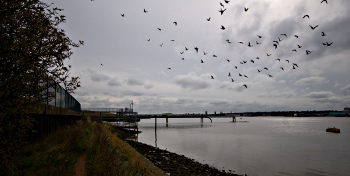 Not long after, we left the coast and made our way to Rainham station and the end of our journey around London. We celebrated with our certificates and a small bottle of procescco. Mission accomplished! We took 3½ hours for the last 18km. The weather was really chilly at around 17°C. It got greyer and greyer but we managed not to get rained upon until we got to West Hampstead, nearly home. Getting home was a bit tricky though, as after a beer quest at St. Pancras the Thames Link was having some issues. In any case, we made it! What's next? The photos that I took on this section, as well as the photos of the other sections of the LOOP, are available as a Flickr set.